Sometimes you have to sound off! Sometimes you just have to sound off when you experience terrible customer service. If you know me you know how I feel about Extreme Customer Service ®. I even own the restricted rights to that phrase. Last night I was in Home Depot and experienced a new level of customer service. Now I have been used to cashiers that talk on the phone while they check you out, don't look at you while they check you out or spout out the programmed phrase "Have a nice day". As I was checking out a Home Depot associate came over to talk to my cashier. The cashier actually turned her back to me and faced the associate. Now I am looking at her back side. As the receipt prints out, she passes it behind her back like it was a baton in a relay race. She never turned around and looked at me. I stood there for a few seconds in disbelief then I finally said "thank you". She never turned around but I did here a faint "you're welcome". Thank you for listening, but I had to sound off! By the way, there will be a call to the store manager tomorrow. Wednesdays are usually busy days for me. Two weeks ago I was with one of my clients in the morning and it was around 11:30am. I was very busy and had to be with another client at 1pm for afternoon meetings. I was working alone in my client's conference room and my cell phone rang. The call was from Bhavesh Patel from Genzyme; the customer that I was scheduled to be with that afternoon. He said I know that you are on a tight schedule today and thought that if I ordered lunch for you, it would be here when you arrived. Now that's Extreme Customer Service ®! I placed my order with Bhavesh and my lunch was ready for me when I arrived. What a great person! Name the Company which uses the following Logo! 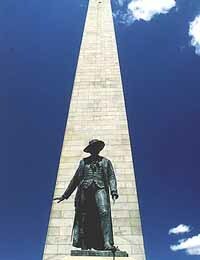 Kim correctly identified the landmark as the Bunker Hill Monument! Enjoy your Dunkin Donuts gift card! It is amazing how fast things change. Last week there was still a lot of ice on the lake and it seemed like spring would never arrive. Then the rains came. Rain that made you think that you should have spent the last ten years building an ark! 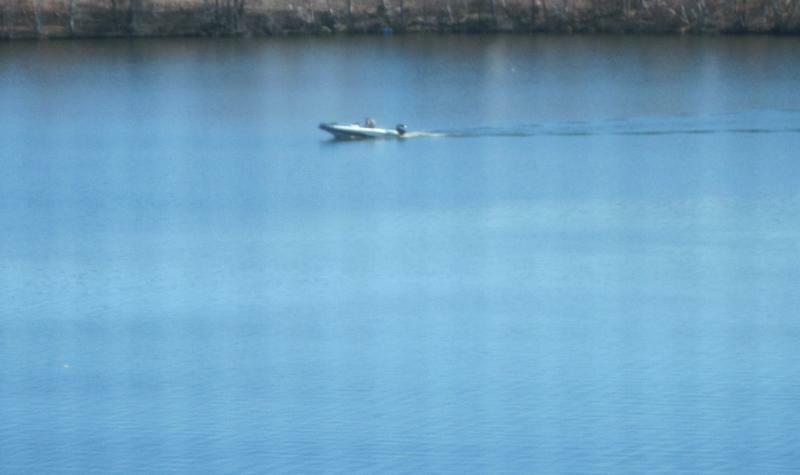 However, I looked at the lake last Wednesday and spotted my first boat of the season. The ice had given way to the rain and I began to think about spring. The very next day there were more boats, ducks, geese, swans and for the first time the skulls were launched for the rowing teams. It made me wonder if everyone had circled on their calendars March 18 to be back in the water. A week ago they would have required ice skates. By the way, where do the swans go for the winter? But I thought about something else. It seemed that people's attitudes warmed up in conjunction with the outside temperature. Is it true that people change when the seasons change? I have heard of cabin fever, so I thought I would check it out for both of us. Who can forget Jack Nicholson's memorable line from the film adaptation of Stephen Kings's best selling novel The Shining. This gripping horror movie chronicled Nicholson's decent into 'cabin fever' induced madness after his family becomes trapped inside an isolated resort in the dead of winter. While not an actual disease foreshadowing insanity, cabin fever can be a very real claustrophobic reaction which occurs when a person is isolated for long periods of time. A lack of environmental stimulation, lack of physical exercise and the shortened daylight hours of winter can have a detrimental effect on the healthiest of psyches'. Unlike cabin fever, Seasonal Affective Disorder (SAD), or winter depression, is a recognized biological disorder triggered by decreased exposure to bright light during the shortened days of winter. The condition is marked by strong cravings for carbohydrate rich foods, weight gain, extreme fatigue, sleep problems and depression. It is estimated that 6% of the population suffers from clinical SAD while another 14% experience a 'subclinical' level of SAD described as "winter blues." Follow the link The Rest Of The Story for the rest of the article which has both symptoms and treatments. It might be too late for this year, but if I copy the link into the resource center of the newsletter, it will remind us to follow-up next fall! I hope you find the tips below helpful. 1. Your newsletter must be an educational tool. Show them you're the professional and can help them in their job. 2. The newsletter must be 70% content and 30% advertising. Become a trusted resource. 3. E-newsletters should be published every two weeks. Once a month is not frequent enough and once a week is too often. 4. The newsletter must go out the same day each week and the same time each week. 5. The newsletter should go out early in the a.m. so that it is waiting for people when they open their e-mail up in the morning. 6. Never use stock photos, use real photos even if they are bad. 7. Run a contest to make it fun. 8. Where you might have a president corner make it personal, not business talk. 9. Run a series of educational articles to keep people informed. In this section, we like to pass along websites that have helped me in my business or have helped my friends and customers. I am sure there are pros and cons, so I suggest you check them out for yourself. After each website appears in this column, we move it to our "Resource Center" in the left hand column of this newsletter. This way it continues to be a resource for future use and future readers! If you are looking for a site that can provide you with hundreds of free sample business forms this could be the place for you. I have used this website for all types of business forms. When you reach the website, scroll down the page and on the right side you will see a section called FormNet Menu. Here is where you can download the forms. Be careful of the legal forms at the top right side of the web page, they will want you to pay for those. Selecting an electronic security integrator - Why is their company different? For years as an end-user, as an integrator and today at IBP, I interview and select electronic security integrators, and it is often very frustrating. I set up four interviews in a day with different companies at 9am, 11am, 1pm and 3pm. At one point during the interviews I ask the following question "What makes your company different from your competitors?" That is a fair question to ask, correct. answers are the same. Whether they have been in business for 20 years or 20 months, the answers are the same. Let me look into my crystal ball and predict their answers. 1. We have the best people. 2. We have the best products. 3. We have the best solutions. 4. We have the best service. 5. We have the best training. 6. We provide quality installations. 7. I will be there for you and here is my cell phone number. Does this sound familiar? At the end of the day, the interviews blend into each other and often times with everyone saying the same thing it is difficult to remember who said what. No one really differentiates themselves. Here are a few questions to ask, to help them differentaite the companies. Tell them you want to hear about the folklore of their company. You want specific and real stories! a. Ask them they how their company has exceeded their customers expectations and blown them away. b. Ask them to show you letters and e-mails from customers showing they provided Extreme Customer Service®. c. Ask them about situations where the installation was a disaster and they transformed it into a positive experience for the customer. d. Ask them about the last three customers they lost and why. e. Ask them about situations where the company had to step up to the plate to do the right thing, when it cost them money out of their pocket. f. Ask the sales person what he/she has done to exceed their customers' expectations from a sales standpoint. g. Ask them to share stories of how their company has exceeded their employees' expectations. Do not allow them to skate or dance around. If you wanted to watch someone dance, you could turn to "Dancing with the Stars". Be very specific and keep them focused on real examples. What does this mean to you? This will help separate the sales propaganda from the true folklore. If they are a true customer service company, you will not be able to stop them from telling stories. If they keep asking you what you mean and have to stretch for a story or two, this is probably not the right partner. Over the past six weeks I have shared advice in the areas of factory certifications, warranties, checking references, service contracts and today determing why they are different. This is just a small part of my four hour workshop "Selecting and Negotiating with a Security Integrator". If you have a question on a particular topic just ask..